This rare, 19th century still bank is a replica of the Old South Meeting House in Boston, Massachusetts. Measuring 4” wide by 6 ¼” long by 9 7/8” tall, the coin bank is sometimes called the Old South Church. This one sold on eBay recently for over $4,000. This one still had its original paper label and one side retains part of the paper clock face. Since the 1773 mass protest meetings that led to the Boston Tea Party, the real Old South Meeting House has served as a gathering place for discussion and celebration and a haven for free speech. Built in 1729, the Meeting House was the largest building in the colonial town. In the years immediately preceding the outbreak of the American Revolution, citizens would gather in the Old South Meeting House to debate and argue in the aftermath of events like the Boston Massacre. On the night of December 16, 1773, over 5,000 colonists, angered over the tax on tea, met at Old South and after hours of debate, Samuel Adams gave a secret signal which began the famous Boston Tea Party. During the war, occupying British troops took revenge for the Tea Party by ripping out the church‘s pews and using the building as a riding stable. Today, the Old South Meeting House is open daily as a museum and continues to provide a place for people to meet, discuss and act on important issues of the day. the coca-cola building sold for $600 at a non-ebay auction. 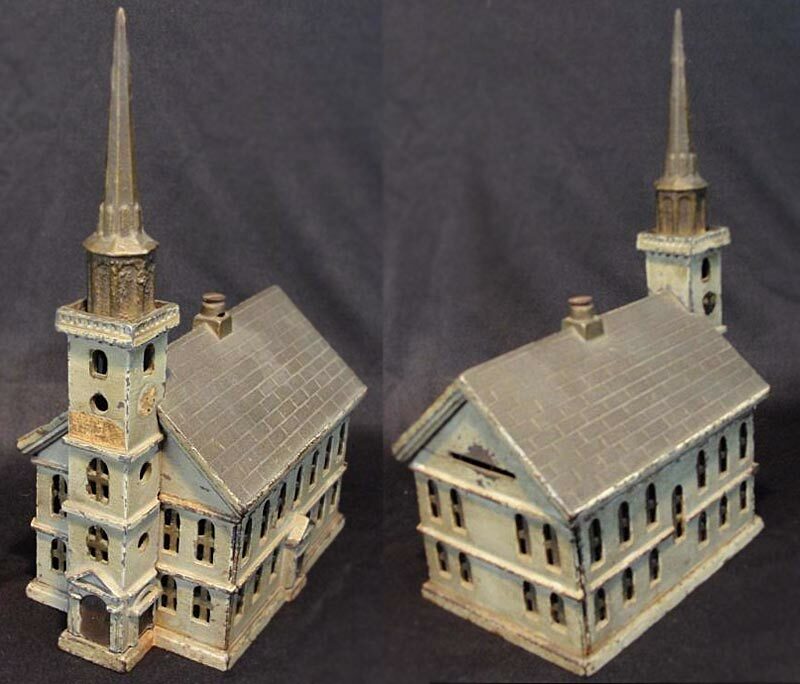 two old south churches recently sold-one on ebay for over $4,000, and a repainted model for $2750.